One hundred years ago today, the world was nearing the final year of what was then called the Great War, and known now to history as World War I—and having a cost of 41 million human beings killed, maimed and missing, it’s important to remember, that at its very essence, this global mass insanity of slaughter and bloodletting was nothing more than a dispute among cousins over who was going to control the how’s and why’s of global trade. The main Allied Powers of the British Empire and Russia Empire, along with their main Central Power adversary the German Empire, you see, were all ruled by the descendents of Queen Victoria—as the three principal monarchs of the age, Kaiser Wilhelm II of Germany; King George V of England; and Tsar Nicholas II of Russia were all cousins with each other: Kaiser Wilhelm II and King George V were first cousins, King George V and Tsar Nicholas II were also first cousins, and Kaiser Wilhelm II and Tsar Nicholas II were third cousins. The competing economic ideologies between these warring cousins, you should also know, were the same as they are today—with the British Empire favoring Globalism (the failed liberal authoritarian desire for a “one world” view that rejects the important role of nations in protecting values and encouraging productivity), and the German Empire favoring Nationalism (loyalty and devotion to a nation; especially a sense of national consciousness exalting one nation above all others and placing primary emphasis on promotion of its culture and interests as opposed to those of other nations or supranational groups). As to why these competing economic ideologies of Globalism and Nationalism were so critical for that time is because Europe was on the brink of mass starvation—and everyone knew it! In fact, just 16 years prior to World War I, in 1898, Sir William Crookes called on science to save Europe from impending starvation as the world's supply of wheat was produced mainly by the United States and Russia. Sir Crookes noted in his presidential address to the British Association for the Advancement of Science that as Europe’s countries populations grew, their own demands would outpace any increase in production. And then would happen to Europe? “It is the chemist who must come to the rescue of the threatened communities. It is through the laboratory that starvation may ultimately be turned into plenty” Crookes cried. Prior to 1912, you must know, the only way that a rapidly transforming industrial world was able to feed itself was through the mass planting of grain crops that required enormous amounts of nitrogen fertilizer—but by the early 20th century had been nearly completely depleted as all sources of guano (bird feces) had been mined the world over. The German Empire, however, in 1912, achieved the greatest scientific achievement in the history of mankind in their discovering how to produce nitrogen by “drawing it from the clear blue sky”—and that has since unleashed a fury on the world as threatening as the invention of the atomic bomb. With all of the world knowing that the German Empire was now able to feed its population, and hence be able to field the greatest army in Europe (if not the world), and its stating that it would not share this historic discovery with any other nation, an elite group of American and British bankers, and business tycoons, meet in London during the Spring of 1912 to plan their revenge. This revenge, of course, meant war—but that neither the British Empire nor United States could afford—that is unless they merged their nations’ banking structures together. In order to merge the banking structures of these two nations, though, the United States first had to first establish a central bank that through the printing of money (fiat currency) would enable it to finance a war against the German Empire. The American bankers and tycoons attending this Spring 1912 meeting in London had an agenda of how to create a central bank structure in the United States—and whose attendees were John Pierpont (JP) Morgan (the richest man in America), Henry Frick (American industrialist and business associate of J.P. Morgan), Milton Hershey (of Hershey chocolate fame), Benjamin Guggenheim (one of the richest men in America), Isidor Straus (American multi millionaire co-owner of Macy’s (with his brother) and former US Congressman), John Jacob Astor IV (one of the richest men in America) and John Mott (one of America most influential evangelists). One of the main incentives used by JP Morgan to get these powerful people to attend this London meeting was their returning to the United States on the new ocean liner he had just built—called the greatest in the world—and named the RMS Titanic. The only passengers of the London 1912 meeting to return on the RMS Titanic, though, were those who opposed to the creation of a central bank in the United States in order to finance a war against the German Empire—who were Benjamin Guggenheim, Isidor Straus and Jacob Astor, and all of whom died when the RMS Titanic sunk on 12 April 1912—as opposed to JP Morgan, Henry Frick, Milton Hershey and John Mott, who all “suddenly” canceled their reservations and survived. 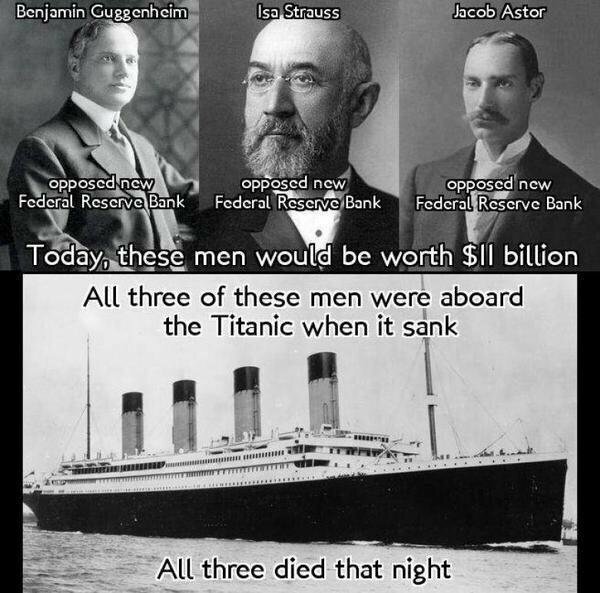 With no powerful opposition left to create a central bank in the United States after the sinking of the RMS Titanic, 18 months later, on 23 December 2013, the Federal Reserve System was created with World War I starting seven months later on 28 July 1914—and that saw, between 1914 and 1917, the American gross national product (GNP) go up an astounding 20%, its manufacturing soar up to 40%, the Allied Powers purchasing over $3 billion dollars in wartime orders and them borrowing from the Federal Reserve over $2 billion in bonds. In fact, it was only when the German Empire appeared to be winning the war in 1917 that the United States even entered World War I—because if this happened, all the billions in loans made by the Federal Reserve would be worthless. 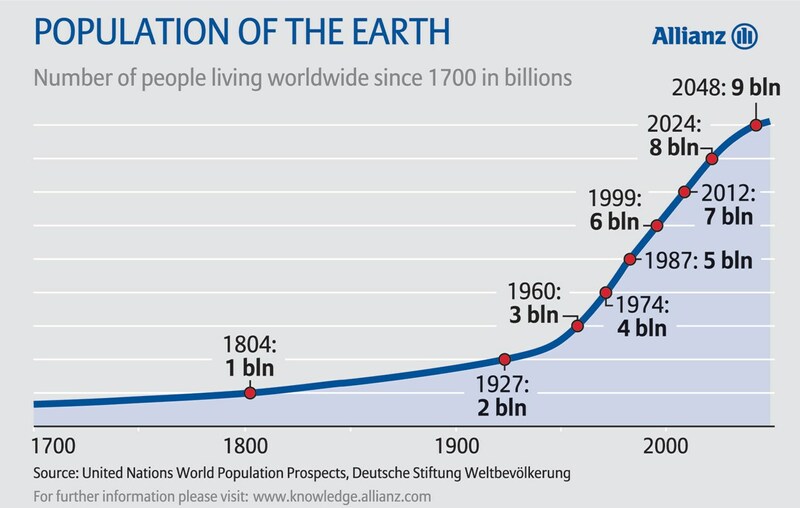 As you can see by this population graph, since the start of the Industrial Revolution, beginning in the 1760’s, the world’s population remained nearly steady—but after World War I, when the German Empire’s nitrogen making process began to spread around the globe, the greatest explosion of human population growth our planet has ever known was unleashed. Now I’m going to tell you something here that 100 years ago every school child in the modern world knew—EVERY SINGLE species of plant life that exists in the world needs nitrogen, and that nature provides via a bacteria called rhizobia that takes nitrogen from the air—but with our pumping massive amounts of artificially produced nitrogen into our planet’s atmosphere for the past century has thrown this whole system off. Because this is happening, the greatest cover-up in history is now occurring keeping you from knowing that our ocean food chains are near total collapse, that all over the globe plants are growing into strange circular patterns, that “mass death events” are now occurring all throughout the Pacific Ocean, that throughout North America hundreds of millions of trees are dying, and that nitrogen filled blue clouds are now filling the skies of Antarctica. To fully understand what exactly these “blue clouds” are we must go back to 1802 when guano (the accumulated excrement of seabirds, seals, or cave-dwelling bats) was discovered to be nitrogen fertilizer needed by the world to grow food—but by 1885, the use of began to throw large amounts excess nitrogen into our atmosphere—and that “scientists” of today call “Noctilucent clouds”. But to thinking that these “blue clouds” of nitrogen floating in at the highest reaches of our planets atmosphere are our only danger, you’d be wrong, as this prize goes to a red alga species named Gracilaria Tikvahiae that voraciously eats nitrogen—and whose effect on our world soon to come I’ll let the Bible explain: “And the second angel poured out his bowl into the sea, and it turned to blood like that of the dead, and every living thing in the sea died. Then the third angel poured out his bowl into the rivers and springs of water, and they turned to blood.…”. As all of you who have read my letters for years know too, I, and my other Dear Sisters, only tell you the truth based on history, observable facts and right knowledge—how you receive these truths, however, I fear greatly for because so many of you are embroiled in the mass insanity enveloping your nations—and that is being deliberately done to you by those who seek your madness, otherwise you’d awaken to true things and prepare for what is soon to come. And to be brutally honest with you too, as nearly every single month we plead with you to support us with just a pittance of what you have, my heart sank to a new level of sadness this week when I read that the supposed fact checking site Snopes—that joined with Facebook to destroy all articles of truth you should know and is now “in danger of closing its doors” due to its owners lavish spending on prostitutes, and who is now going through a salacious scandal riven divorce—raised $500,000 in 24 hours to defend itself against the company suing it. Those who support evilness, it sometime seems, always triumph over those who seek truth and knowledge—but which, RIGHT NOW, I’m asking each of you to make a stand against by supporting us. If you won’t support us for telling you the truth with even the merest pittance, why do you keep coming into our “house” and taking from us what we work so hard to make? Is this honest? Is this fair? Or is it madness?